Commencing with jazzy rhythms and syncopated editing, Rian Johnson’s second feature film opens by detailing the pre-teen origin story of a prodigious pair of sibling confidence men. Orphaned and shuttled from one foster home to another (“38, all told,” narrates actor\illusionist Ricky Jay with sardonic knowingness), brothers Stephen and Bloom hit upon their soon-to-be-mastered profession. Following Stephen’s masterfully-charted plan, Bloom assumes the role of the ingratiating charmer and convinces the “playground bourgeoisie” of a “one-hat” Mid-American town to pay him to lead them to a magical floating light in a forest cave. Their scheme is exposed and on they are shipped, but not before a fleeting measure of success illuminates the perfectly-structured con that will become their signature: the con where everyone gets what they want. The con men get the money and the mark gets to feel a touch of fulfilment, happiness, satisfaction, or whatever you might call it (until they check their account balance next, anyway). 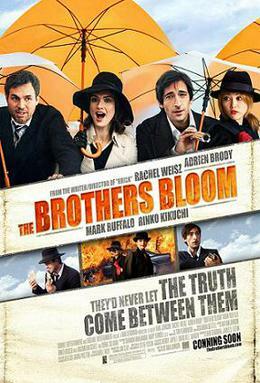 The Brothers Bloom is a caper flick about con men, indeed. But a caper flick that invokes Plato’s Allegory of the Cave in its first ten minutes is also self-evidently going to be about the nature of reality and how the deception, fakery, and sleight-of-hand inherent to the con game calls the firmness of reality into question. This is borne out by the famous magician narrator, recurrent thematic card tricks, further literary references to varied existentialists Dostoyevsky, Melville and Joyce (the brothers are named after the latter’s best-known protagonists), and by a climax in an abandoned theatre, the closing shoot-out literally taking place onstage behind a closed curtain. Much as Johnson’s debut Brick self-consciously transposed hardboiled Dashiell Hammett detective noir into a modern American high school setting, The Brothers Bloom has novelistic pretensions in dealing with the interplay of deceptive appearances and even more deceptive truths fundamental to the caper genre. Also like Brick, it constructs a world that is unquestionably contemporary but suffused with endearing, quirky anachronism. Brick built that anachronism into its baroque film noir dialogue, but Johnson has a real budget for The Brothers Bloom and thus fills his frame with just-outdated visual details and locations (mostly shot in Eastern Europe, though not always fictionally set there). Jokes about anime, cell phones, and karoake place the events firmly in our present, but the world feels arrested, artificially aged, a ships-and-trains era rather than our own intercontinental jetliner one (most of the music is several decades old, which doesn’t hurt the impression). When the Blooms’ ideal model for the con is described as giving everyone involved what they’re looking for, there’s one important exception. Bloom (Adrien Brody) is not getting what he’s after. He’s not so clear on what that is, his adult identity having been swallowed by the serial fictions required of him by the byzantine cons concocted by Stephen (Mark Ruffalo), which are compared to Russian novels in their complexity and emotional shading. After pulling off another successful con in Berlin, Bloom tells Stephen that he wants out to figure out what it is that he wants (there’s a couple of leftfield camel jokes in this scene and I won’t spoil them because you probably never thought you’d read that in this review). Unfortunately, what Bloom seems to want is to get drunk on an island off Montenegro. Not to knock such an ambition, more power to him. But Stephen has no trouble finding and convincing him to come back for One Last Job (where’s the caper movie about a team on its way up rather than out?). The job involves an orphaned New Jersey heiress named Penelope (Rachel Weisz) who lives alone in the largest private residence on the Eastern Seaboard and appears to have mild-to-moderate mental problems. With their mostly-mute Japanese explosives expert Bang Bang (Rinko Kikuchi) in tow and posing as antique dealers, the brothers ingratiate themselves into her life via a vintage scheme involving a car accident, a sea voyage, a rare 8th-Century manuscript, a mysterious Argentinian, and a flatulent Belgian museum curator (Robbie Coltrane). But Bloom develops what he thinks are genuine feelings for Penelope, and this threatens the con and his relationship with Stephen. The baroque nostalgia of the film’s askew sense of humour strongly evokes Wes Anderson’s work at times (indeed, Brody was working on The Darjeeling Limited when he first read Johnson’s script). But this is no hermetically-sealed doll’s house of deadpan quirk like Anderson peddles, but a freewheeling, energetic, and tonally inconsistent picture with plenty to recommend it but enough to dissuade the curious as well. It’s full of tossed-off wit (“Eat your waffles, fat man,” Bloom tells the Curator), wacky as all get out before being ground to a halt for emotional thrusts. Like his next film Looper, Johnson can’t resist concluding his labyrinthine thematic path with an unimaginative gunfight, either. What delight can be found in The Brothers Bloom is found in the performances, or at least in one of them. Brody and Ruffalo are both just all right as the titular flinty brothers, Kikuchi and Coltrane are funny in supporting roles and Maximillian Schell shows up in his final screen role as their malevolent mentor Diamond Dog, complete with eyepatch, headscarf and quasi-medieval robes like a lurking figure straight out of Harry Potter‘s Knockturn Alley. But Rachel Weisz snatches up as much of this movie as she can and runs with it, arms flailing wildly. Weisz is often reduced to the role of attractive love interest (name a Hollywood actress outside of, say, Meryl Steep or Cate Blanchett who isn’t). Johnson, unfortunately, slots her into that role as his film reaches its closing act; Bloom literally has her wait in the car as he goes off to the final confrontation. But prior to that, her Penelope is a hilarious neurotic. Hugely wealthy with no personal connections or responsibilities, she “collects hobbies”, demonstrating her many talents (including karate, Spanish guitar, breakdancing, skateboarding, and juggling chainsaws) to Bloom in a side-splitting montage. She becomes giddily excited when the con turns the brothers into smugglers, wanting herself to become one and doodling “Penelope the Smuggler” on looseleafs like a smitten schoolgirl. On a train journey to Prague, she gets plastered and becomes outrageously sexually aroused by a thunderstorm. Weisz’s Penelope is a memorable comic creation, and she throws herself into it with abandon when the movie allows her to. The Brothers Bloom corkscrews amusingly into fun often enough, but it also relies on generic conventions a bit too heavily. Furthermore, it’s a film with things on its mind. Johnson laudably tries to deepen and expand upon the thematic implications of the caper/confidence genre, drawing out intellectual metaphors from the sort of movie that tends more towards performative mental gymnastics. It’s an uneasy fit, the breezy whimsy matched with the philosophical niggling of reality vs. fantasy, true vs. assumed nature. In the end, neither side of the equation quite adds up. The Brothers Bloom is neither an unqualified joy of a caper nor a chin-stroking rumination on the porous nature of reality and its implications for human identity construction. A bit of both, never quite enough of either.